Jarnac is one of those relatively quiet towns on the Charente River where there is ample evidence in its architectural heritage of a wealthy past. The huge Courvoisier building that dominates the main square and stretches along the north bank of the Charente gives you a further indications as what made this town a wealthy one at one point. It’s also famous as the place where the late Socialist President Francois Mitterand was born, lived and was buried. 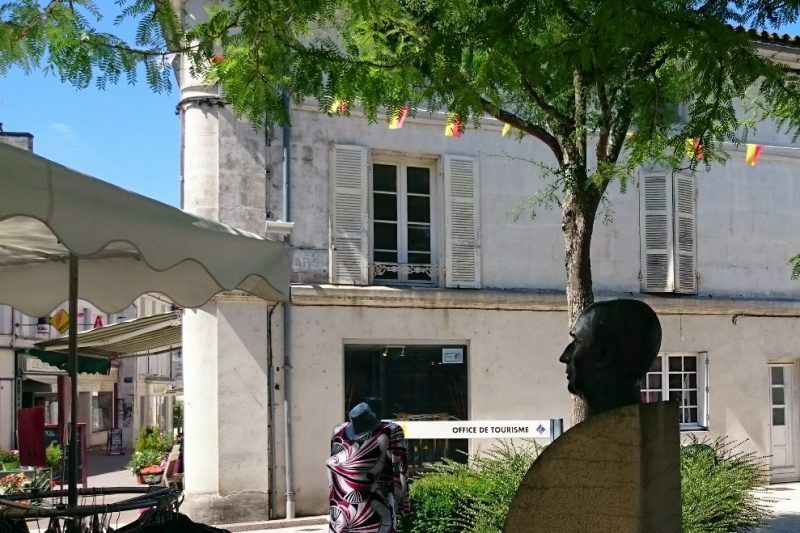 The real place and time when Jarnac comes alive is on a Friday morning and all social and economic activity is centered on the unusually modern-looking indoor market on Rue du Banvin. It’s not a huge one, even though it does spill out onto the adjoining Grande Rue and even up to Place du Baloir (where you’ll find another bust of Mitterand). It’s on every day from 07:30 to 13:00 except Monday, but it’s the Tuesday and Friday version that are the largest and the Friday version – with everyone stocking up for the weekend – is the liveliest. It makes a change to have a new clean-looking building in such an old town but there are some superb foods to try here, including bakers with cheese-and-lardon bread sticks for a euro, fresh seafood, hams, jams, Pineau, Cognac wines from small producers, as well as great charcuterie. Probably the pick of them all is Alain Beau – local genius who seems to sell his delicious produce only through the Jarnac market. Try a couple of slices of each of his pâté varieties.